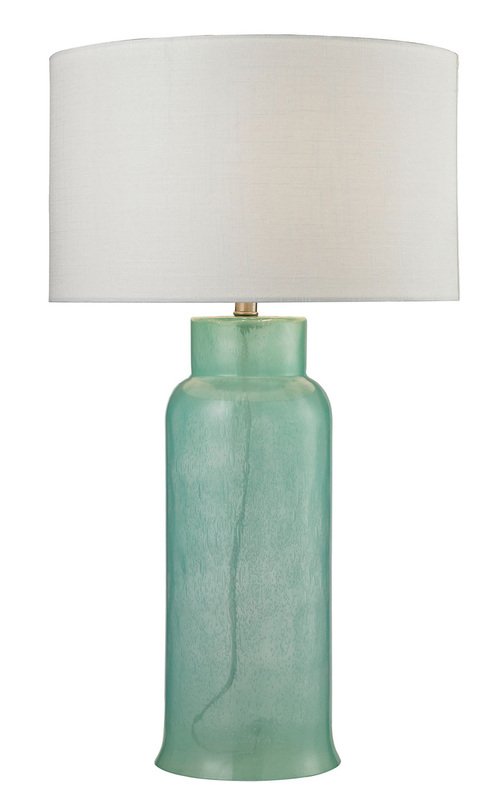 Featuring a beautiful white finish, this gorgeous Dimond Glass Bottle Seafoam Green Table Lamp adds just the right ambiance to your home decor.R elaxed in tone and form, this piece of mouth blown water glass is hot sprayed in a relaxed and cool seafoam green. $267 Sale $178. Free shipping. Buy here. 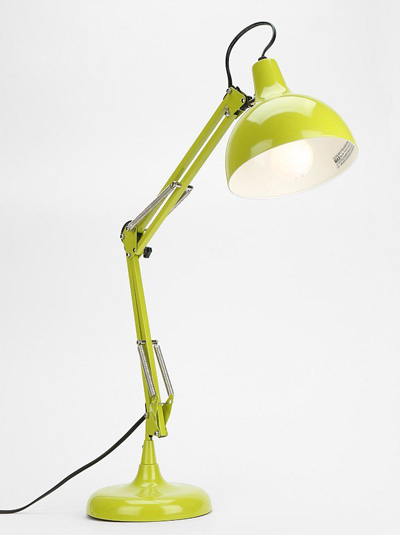 Inspired by 1960s mopeds, this retro French LED Swabdesign Green Task Lamp sports a bold industrial shape with a tilting head, adjustable arm and coordinating colored cord. $119. Buy here. 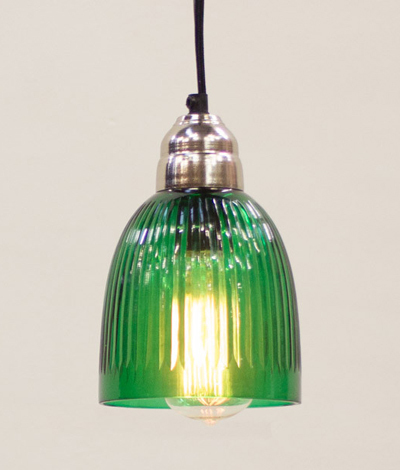 This vintage-inspired Green Hanging Glass Pendant adds color and character to your home. Measures 5″ x 8.5″t. $35. Buy here. Illuminate your deck, backyard trees or party canopy with these Flameless Candle Hanging Bottle Patio Lights, each with an LED flameless candle inside, so you needn’t worry about messy wax dripping or candles overturning. $18. Free shipping. Buy here. 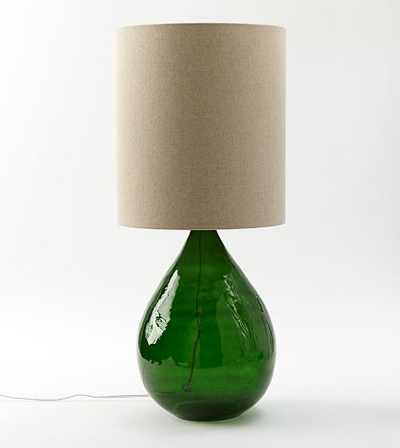 This Green Seeded Glass Lamp is crafted with air and blown glass for a unique seeded glass look. Hand-painted in a pale green hue then topped with a natural linen shade, this lamp is truly a found treasure. $59. Buy here. 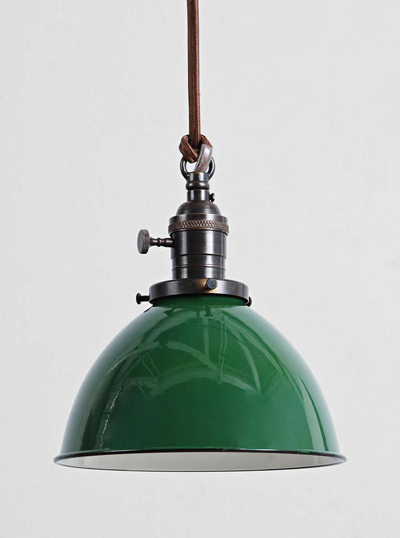 This intricate iron Beacon Sour Apple Lantern sheds modern new LED light on old-school oil designs. 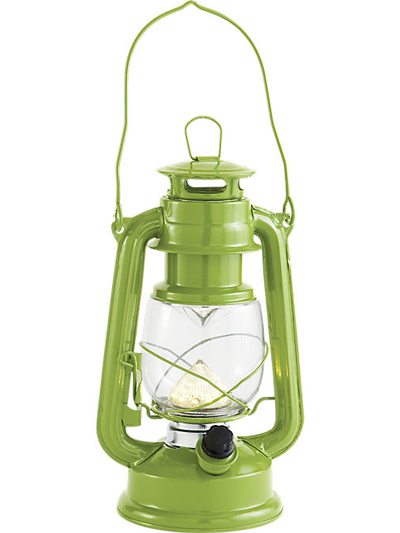 Powdercoated slick sour apple green, indoor/outdoor lantern safely adds a warm glow on the patio, camps out or dines inside. $19.95. Buy here. 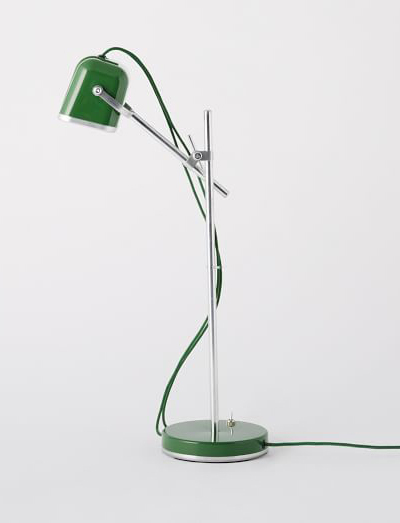 This Green Clip it Lamp features a metal clip that is easily adjustable to shine light in any direction. Works well on desks and bunk beds. $29. Buy here. This industrial-inspired hanging Flea Market Rx Dome Pendant is crafted from solid brass and hand-finished with ebonized rust patina. Adds a unique, vintage-inspired touch to any space. UL listed. $249. Free shipping. Buy here. 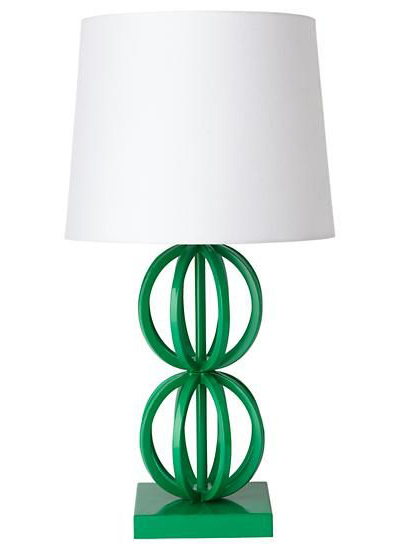 This Two Ring Table Lamp Base gives a nice pop of color to your décor. Its unique shape and durable construction help it fit in almost any room. $119. Buy here. The intricate iron Beacon Lantern sheds modern new LED light on old-school oil designs. 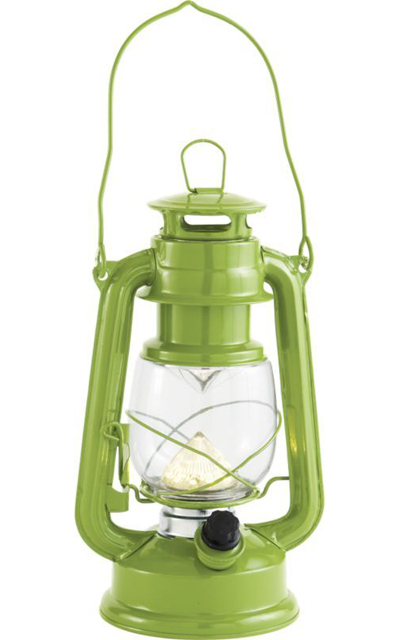 The powdercoated, indoor/outdoor lantern safely adds a warm glow on the patio, camps out or dines inside. $19.95. Buy here. The ever-popular chevron pattern is popping up everywhere. 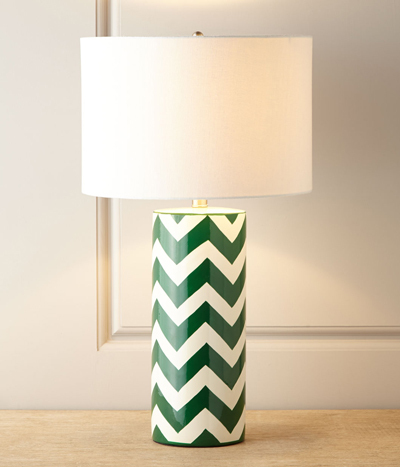 Here it decorates the cylindrical base of this ceramic Green Chevron Lamp to bring fashion and light to any room. Includes linen shade. $180. Buy here. 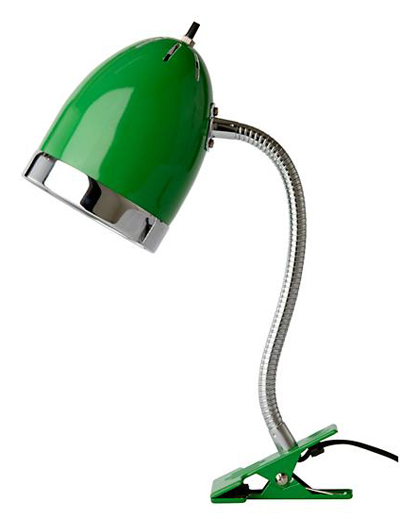 This metal Green Pop Desk Lamp features a retro-inspired design we love. Adjustable so the light shines just right! Light bulb not included. UL listed. $89. Free shipping. Buy here. Bring the smooth, open elegance of a glass table lamp to your space with the Pierson Table Lamp. 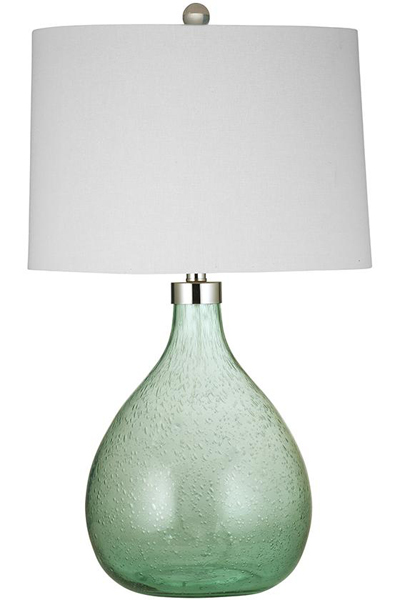 The rounded, green glass base has the look of an antique bottle; silver hardware and a white drum shade add contemporary appeal. $299. Free shipping. Buy here. 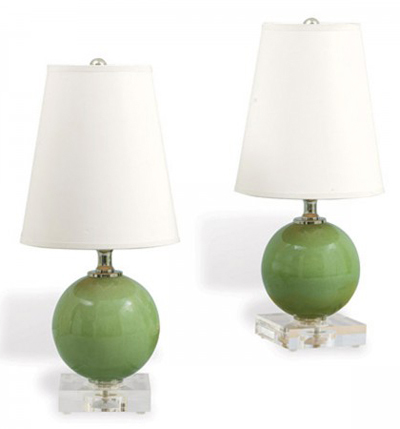 This Jenny Ball Lamp in Green – Set of 2 features a beautiufl crackled porcelain glaze. Includes white paper shade. Measures 16″H x 7″D. $210. Buy here. 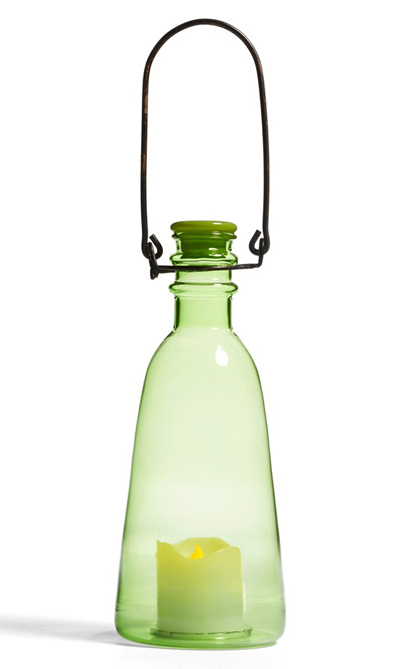 This textured, teardrop-shaped Green Glass Jug Table Lamp comes in glamorous green glass. Larger than an average table lamp, it makes a modern statement in any room. Natural linen shade. $169. Buy here. 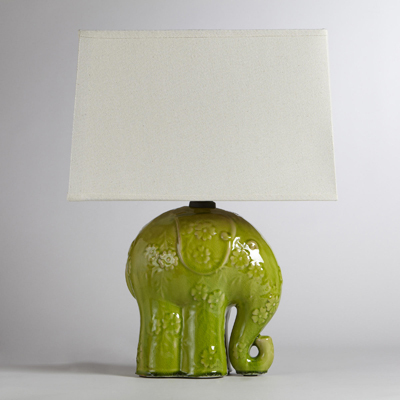 Crafted in jade-colored ceramic with a crackled finish, the Elephant Ceramic Table Lamp is as lovely as it is lucky – its upturned trunk is believed to invite good fortune. Plus, it comes with crisp, ivory-colored shade. $79.99. Buy here. The simple design of the Stray Dog Designs Esme Glass Table Lamp veers towards retro with a grass green tole shade painted gold on the inside and trimmed to match. Its oversized clear gourd base makes a statement while virtually blending into the decor. $484. Free shipping. Buy here. 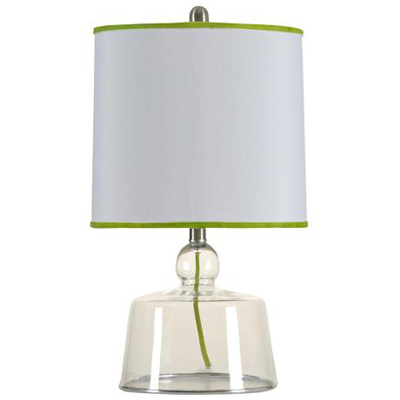 Brighten a desk or end table with this contemporary Clairmont Green Shade Clear Glass Table Lamp. 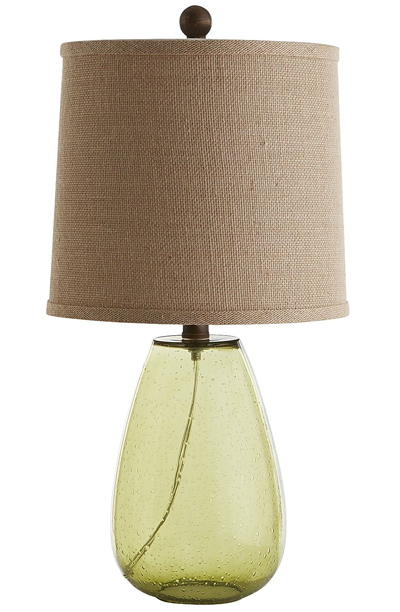 The look is light and fresh, with a clear glass base construction and a soft silk drum shade. 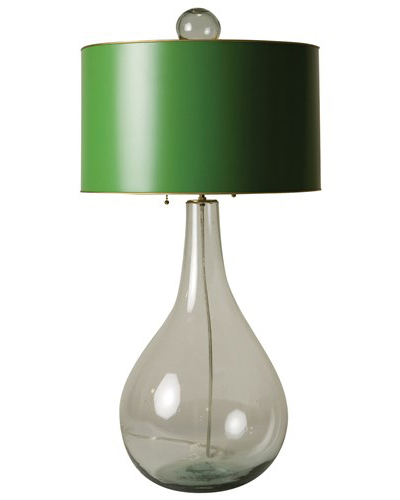 The shade features green trim, adding just the right amount of color to this handsome lamp. $114.91. Free shipping. Buy here.